OSAGA ® pond filters and stream running pump "Black flounder ECO"
OSAGA pond pumps of the series black FLOUNDER ECO are high quality and particularly energy efficient endurance pumps that can promote also dust and loose dirt particles up to 6 mm in diameter without clogging. They characterized as asynchronously canned pumps high pressure and flow rates at low power consumption. The low-wear ceramic shaft ensures a long service life. 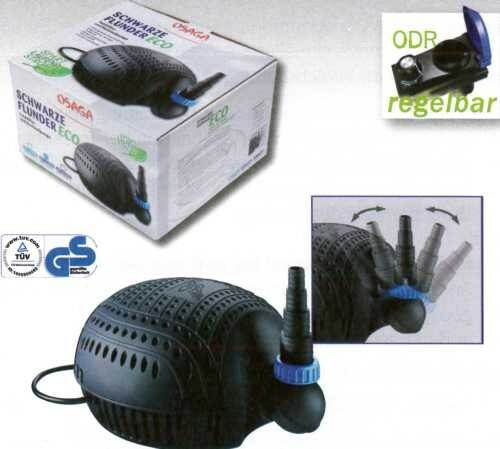 Black FLOUNDER ECO is suitable especially for the operation of pond filters as well as creeks and waterfalls. The pump body is wrapped in a large strainer, which prevents a premature clogging of the pump.